We’d love your help. Let us know what’s wrong with this preview of Down Among the Dead Men by Kerry Wilkinson. Jason Green’s life is changed for good after he is saved from a mugging by crime boss Harry Irwell. From there, he is drawn into Manchester’s underworld, where stomping into a newsagents and smashing the place up is as normal as making a cup of tea. To ask other readers questions about Down Among the Dead Men, please sign up. I have read quite a few books by this author in the last twelve months and to be honest this was a strange one for me. In one way I couldn't put it down, as I wanted to know what was going to happen next but in another way I didn't feel it lived up to the standard of the previous Kerry Wilkinson books I have read. Hard to rate as I enjoyed the plot but not necessarily the rest of it so I have played safe giving it a three star rating. We first meet the main character Jason as a young boy, when he I have read quite a few books by this author in the last twelve months and to be honest this was a strange one for me. In one way I couldn't put it down, as I wanted to know what was going to happen next but in another way I didn't feel it lived up to the standard of the previous Kerry Wilkinson books I have read. We first meet the main character Jason as a young boy, when he is rescued from a group of thugs by crime boss Harry Irwell. Fast forward to present day and we are back with Jason now grown up working for Harry. Life isn't great for Jason, he lives with his alcoholic mother and helpless brother. He earns his money in Manchester's underworld, working for Harry and breaking the law is an everyday occurrence for him carrying out his duties. So when a mysterious woman offers him a way out, his head is turned. I'd like to thank Kerry Wilkinson, the publisher and Netgalley, for a copy of 'Down among the Dead Men' in exchange for an honest review. Kerry Wilkinsons DS Jessica Daniels series has been on my reading list for ages, the first one sat on my shelf just waiting to be read. I saw this stand alone novel on Netgalley and figured it was a good place to start before diving into a long series. I'm glad I did. 'Down among the Dead men' kept me interested from page one. Jason is someone you instantly re I'd like to thank Kerry Wilkinson, the publisher and Netgalley, for a copy of 'Down among the Dead Men' in exchange for an honest review. Jason is someone you instantly respond to, almost wanting to look out for him yourself. Although he plays the tough guy, he's really just a lost kid who doesn't even know the first thing about females. Other characters are built up well too and through their parts in the story, you get an even bigger, sadder picture of Jason and the life he has had. Kerry Wilkinson is the prolific writer of the Jessica Daniels and Andrew Hunter series set in and around Greater Manchester all of which are excellent crime thrillers. Down Among The Dead Men is the new standalone book from Kerry Wilkinson, which is far grittier than his other thrillers set in the very dark underbelly of Manchester. To some from Manchester this may seem a little tame on what actually happens on the streets, to the read it is enough to pique interest. Jason Green’s life is changed when Harry Irwell steps in when he is a teenager to stop him being badly beaten up, who showed him that compassion did exist in Hulme, a hard working class district of Manchester. Hulme having never recovered from the slum clearances of the 1960s, their replacement housing did not inspire greatness just crime and fear. Jason lives with his alcoholic mother, and his younger brother Chris, all with their own different problems all with their failed dreams. Jason works for Harry Irwell, and is paid in a way that makes him look like a proper employee, tax and National Insurance paid. He delivers messages for Irwell and sometimes packages and then delivers what is required to Irwell. Often meeting Irwell at his casino in town where the music is played loud to drown out whatever is being said. Jason visits the library after every job to check his account and also to check on the weather report in Crete, where he introduced to a new world by student and librarian Lucy. At the same time Natalie a woman also offers him a new world, a salvation from what is dragging him down and let him live. Jason is conflicted he does not know which way to go and who he can really trust. When Chris, Jason’s brother goes missing, and Irwell is in no hurry to help him find his troublesome sibling, Jason puts his own life at risk. First he goes in to North Manchester a place controlled by another gang and then he drives over to Oldham to see the boss of that gang. Jason is now in a place where he really does not know who to trust. As Jason Green tries to work out who to believe and what he needs to do next, the work is still coming in, always seemingly placing him in more danger every time. Being painted by Lucy and chased round by Natalie who wants him to betray Harry, Jason is confused even more so when his brother reappears battered, bruised with broken bones. As the book races towards its conclusion there are some interesting twists, and asks the question will Jason ever know the truth, who can he trust and is he able to see through the bull. He knows that he will have to fight to the end to achieve his aim of retiring in the sun, and will these women keep confusing him and his feelings. If only he could have a decent night’s sleep. This is an excellent standalone book that takes the reader on a tour of some of the darker sides of Manchester; it does not paint a picture of a romantic Manchester. With some interesting twists and turns this book keeps you on edge all the way to the end. This book kick's off with a young Jason Green, and life as it is for him. He is rescued from a good kicking by Crime boss, Harry Irwell. It then fast forwards to Jason now. and the life he is living. He seem's quite an ordinary guy, doesn't like to stand out, doesn't like attention. Despite seeming quite ordinary he is very much playing at being one of the big boy's. Where robbery just seem's as normal as going to work for the day. We shoot from past to present in this book, which gives you good b This book kick's off with a young Jason Green, and life as it is for him. He is rescued from a good kicking by Crime boss, Harry Irwell. We shoot from past to present in this book, which gives you good background on the characters. Despite what they do, I did like a few of the character. And Jason seemed like someone that everyone could know, that guy who doesn't really stand out, the one you think is quiet, the one you think just goes home and chills out of an evening. There seemed to be quite a bit of background and getting to know Jason, which I liked. I just felt that the start of this book was a little slow at taking off. However once it took off it took off I really got into in. The story was interesting and certainly kept me reading, I read this book pretty quick. And did enjoy it. It was a little different to what I have previously read by Kerry, but still a really good, interesting read. It’s difficult to say too much more about the storyline as to do so would ruin it for those people that haven’t read it yet. It also makes you wonder how different life would have been for Jason had he not met Harry on that day. How would things have turned out for him. I have to admit, I kept waiting for Jessica to pop up. (those that have read Kerry's other books will know where I'm coming from). but sadly I have to wait forever for the next Jessica book. I have enjoyed Kerry Wilkinson books in the past, so was looking forward to reading another one of his books, expecting yet another brilliant read. And Down Among The Dead Men certainly hit the target for me, although it's very different from his Jessica Daniels series. You first meet Jason as a young boy. He's escaping from a group of thugs and is rescued by crime boss Harry Irwell. The book then switches between past and present, as you learn more about Jason's background and his current situat I have enjoyed Kerry Wilkinson books in the past, so was looking forward to reading another one of his books, expecting yet another brilliant read. And Down Among The Dead Men certainly hit the target for me, although it's very different from his Jessica Daniels series. You first meet Jason as a young boy. He's escaping from a group of thugs and is rescued by crime boss Harry Irwell. The book then switches between past and present, as you learn more about Jason's background and his current situation. I wondered how his life would have been different if Harry hadn't rescued him that day. Jason lives with his alcoholic mother and a deadbeat brother. He earns his money in Manchester's underworld, doing jobs for Harry that no one else wants. Robberies and crime are second nature to him. But he also dreams of a better life. So when a mysterious woman offers him a way out, he knows he would be a fool to turn it down. Down Among The Dead Men was really easy to get into and intrigued me from the start. It's written at a steady place and has some believable and interesting characters, with some great twists and turns. I read it in a couple of hours. I was fortunate to receive an Advance Reader Copy from the author in exchange for an honest review. This is a stand-alone story. The characterisation and telling is great. I wonder what became of Jason and Lucy. Characterisation has always been the trait which I admire the most in Kerry Wilkinson's. He has a knack for getting inside his characters heads and making them believable to his readers. I feel like the main protagonists within his latest book let him down a bit in that respect. They are a bit one dimensional, predictable and Jason, in particular, just not very believable. Having started a review like that, then you may be left wondering why I rated this book with four stars? The reason for that is the fabulous plot, which is one of the stronger Wilkinson has put together in my opinion. I am well documented in the belief that the Jessica Daniel books are his weakest and that the Silver Blackthorn ones are his strength. I also rate his debut stand alone thriller 'Watched' amongst the best books written that year. Down Among the Dead Men sits somewhere inbetween. This book is very different from Wilkinson's other works and it is an experiment which works well. We hear the story from the point of view of a criminal, rather than the usual cop/investigator and it is a refreshing change. I read the whole thing in two sittings and, whilst satisfied with an ending I didn't see coming, the amount of unanswered questions leave me wondering if there is at least another volume in this series to come. The again, I remember questioning the unanswered questions in one of this authors previous works and when I asked him I learnt this was done in purpose. In this case, Wilkinson might be deploying the same tactics again. I don't mind either way, but I would at least like to know who keeps opening the window, never mind if Jason finally gets to see the rest of Lucy's bra! Back to the aforementioned character flaws. The mother and the brother I felt were completely one dimensional with absolutely no redeeming qualities. Lucy was too twee; I mean, it was blatantly obvious Jason was a wrong 'un, I can't see any reason she would be interested in him. Irwell was not a convincing heel either; I mean, you think he'd be pretty pissed off that Jason keeps scaling his security fence. Jason seemed too, well thick, to be the master criminal he was portrayed as. You surely don't get to sit at the top table of a Mafia boss if you're not good at what you do. His way around women was more akin to a twelve year old than that of someone in their mid twenties. Interestingly, the slight lack of development in this area didn't detract too much from the novel and I would class it as an excellent entry into Wilkinson's vastly expanding bibliography. Kerry Wilkinson was on my TBR pile for a long time before I finally took the plunge and picked up the first book in his DS Jessica Daniel series, Locked In. I've since read a couple more books from that series and I am really enjoying Kerry's storytelling ability and his brilliant characterisation and hoped that would continue with Down Among the Dead Men. My favourite genre of books are those written by the likes of Martina Cole, Jessie Keane and Kimberley Chambers and that's the vibe I got wit Kerry Wilkinson was on my TBR pile for a long time before I finally took the plunge and picked up the first book in his DS Jessica Daniel series, Locked In. 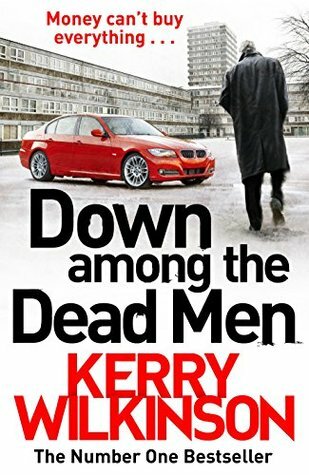 I've since read a couple more books from that series and I am really enjoying Kerry's storytelling ability and his brilliant characterisation and hoped that would continue with Down Among the Dead Men. My favourite genre of books are those written by the likes of Martina Cole, Jessie Keane and Kimberley Chambers and that's the vibe I got with this book even before picking it up. It wasn't quite in the league of any of the aforementioned authors but it was still an enjoyable read. Down Among the Dead Men opens with an instantly recognisable scene to me coming from Liverpool. Liverpool isn't dissimilar to its rival city, Manchester and there are areas in Liverpool exactly like the one depicted here which sees Jason Green as a teenager, out walking the streets in his brand new trainers. A local gang immediately spots Jason sporting the shoes but Jason is savvy about the local area and makes a run for it, eventually being rescued by local crime boss Harry Irwell. Jason then essentially owes Harry and finds himself unwittingly (at first) drawn into Manchester's notorious underworld. Kerry Wilkinson's writing is vivid and descriptive. The reader immediately gets a real sense of the setting and can easily picture the scenes playing out on the page. Characterisation is mostly strong throughout, apart from the fact that compared to some of the villains I've read about in the past, Harry was a lot tamer than some of those. Jason is an extremely intriguing character however and as with most villains in this genre, there were times when I wasn't completely sure about him. He isn't for example a down and out criminal, that was never his destiny. After all, there are plenty of kids who do manage to go on and escape the area they are born into, but because of his meeting with Harry, Jason found his life taking a very unexpected turn. Because we meet Jason before all of this, and learn more about his history before he turned to crime, I felt that it was easier to see some of the good in him and truth be told, I might even have liked him sometimes. Apart from new additions to his brilliant Jessica Daniel series, from time to time, Kerry Wilkinson comes out with other standalone thrillers. I read 'Watched' a few years back and I really enjoyed that. 'Down among the dead men' is another such standalone book and I was lucky enough to receive an advanced review copy from the author. Wouldn't it be extraordinary if while you're being battered by a gang of bullies, when everything seems lost, a powerful crime boss comes to your rescue? You wouldn Apart from new additions to his brilliant Jessica Daniel series, from time to time, Kerry Wilkinson comes out with other standalone thrillers. I read 'Watched' a few years back and I really enjoyed that. 'Down among the dead men' is another such standalone book and I was lucky enough to receive an advanced review copy from the author. Wouldn't it be extraordinary if while you're being battered by a gang of bullies, when everything seems lost, a powerful crime boss comes to your rescue? You wouldn't believe it, no? This is what happens to young Jason Green. Harry Irwell did not only save him by scaring the crap out of his assailants, he also took him under his wing, becoming a father-figure for him and employing him as one of his 'sons', delivering 'messages' or collecting 'parcels' on his behalf in exchange of hefty sums of money. But Jason is not a typical thug, he's a reserved, unnoticeable guy who doesn't like to mix with other people. With a good-for-nothing mother and a trouble-making brother, Jason is the only member of the dysfunctional family that has to buy provisions and take care of everything. "Sometimes we're defined by the ruthlessness of our decisions." Stuck in the middle of a complicated, dangerous game, Jason wants out, but he knows that to just up and leave Harry Irwell is not an option. Then two different women enter his life, each making him rethink his options and offering him a different escape route. Which one will he choose? And will he really be able to leave the man who has guided him throughout his life? Thanks to Kerry's easy flowing writing, I read this book pretty quickly. Without confusing the reader, the story goes back and forth from the present day to the past so that we have a glimpse of Jason's life as a youth. However, I must say that it took me quite a long while to really feel gripped by the story. I found certain parts repetitive and there were also a number of questions that were left unanswered by the end. I don't know if the author did this on purpose or if he has in mind to write a sequel, but I love it when stories tie up everything at the end without leaving any loose ends. However, having said that, this book is quite an interesting, different read. Even though crime, drugs and gang wars are at its centre, there is no police involvement in the story and the main character is not a detective but a gang member. In my opinion this is a great idea and a refreshing approach to story telling. With thanks to the author for an advanced review copy. I read a lot of books this year, but I have to say that Down Among the Dead Men has got to have been my favourite of all time. I am quite a picky reader and usually only read books from specific genres, and even though I am fairly new to these kinds of books, I will say I was very pleased with it. The story starts out as a flashback, where you meet Jason Green. After he is saved from a group of thugs by crime boss Harry Irwell, he is brought into the gloomy, dark side of Manchester; where robberi I read a lot of books this year, but I have to say that Down Among the Dead Men has got to have been my favourite of all time. I am quite a picky reader and usually only read books from specific genres, and even though I am fairly new to these kinds of books, I will say I was very pleased with it. The story starts out as a flashback, where you meet Jason Green. After he is saved from a group of thugs by crime boss Harry Irwell, he is brought into the gloomy, dark side of Manchester; where robberies are as normal as brushing your teeth. However, Jason has his eyes set up on a bigger prize, which is why he is saving his money and time for the perfect moment to arrive. But when a woman walks into his life and offers him a way out, he would be a fool to not take the chance. I have really enjoyed other books by Mr Wilkinson. I finished It but did not enjoy as much as his others. Although I must say I did not see the final ending involving Natalie. Good twist. I really enjoyed this book, it had a good, gritty story and the flashbacks throughout the book, to Jasons earlier life periods, added to the build up. I was intrigued by this story and what had happened in the main character, Jason's past. I would be interested to read any follow-up. A great read! This is the first book I have read by Kerry Wilkinson. I shall certainly read some more. I was lucky enough to win a copy of this book as an ARC and first of all thanks go to the author for that one. But Jason isn’t a casual thug: he has a plan that doesn’t involve blowing his money on the usual trappings. That is until a woman walks into his life offering one thing that money can’t buy – salvation. Wasn’t sure what to expect when I received this book for review but have to say Kerry has done it again. This is an excellent stand-alone read and one that has allowed me to get my reading mojo back (have been picking up books and reading them and enjoying but this author yet again as usual had me HOOKED). Jason Green would be the guy you walked past in the street, a normal guy who doesn’t stand out in a crowd. He is ordinary but unbeknown to some inhabits a shady criminal underworld and therefore does not want or wish to be noticed. He doesn’t make friends easily and has a group of people he relies on. However, someone has noticed him and someone will go out of their way to ensure Jason helps them. The story is told across a period of 11 years and you are treated to flashbacks in the story behind Jason Green, the boy he was and the man he is becoming. You have his rescuer, Harry Irwell (who is a name you know through organised crime), Harry’s right hand man “Carter” along with other people that Harry relies on. You have Harry’s rival (or are they) Richard Hyde along with Jason’s brother Chris and his mum. You are made to feel sorry for Jason in one step and unsure of where your loyalties will lie in another. The book had me hooked and has been read in a week (which lately with a family and a full time job) can be hard work. However yet again Kerry Wilkinson has done it and yet again I am left waiting patiently for the next book. Kerry has a flare for (in my honest opinion) of providing books with unexpected endings. I have questions which are left unanswered and left to draw my own assumptions of how things conclude. This is a book that has the potential to be made into a series but is excellent as a stand-alone read. My rating is 5 / 5. Jason Green, neglected by his alcoholic mother and physically abused by the “uncles” who keep joining the dysfunctional family, is fighting for his thirteen-year old life. Five boys are trying to steal his first ever decent birthday present; air cushion trainers. They are chased off by the arrival of Harry Irwell whose name alone is enough to scare off anyone daring to take him on in a fight. He is the kingpin of a huge organisation dealing in drugs, protection money and many other illegal pursuits. Harry takes Jason under his wing from that time onwards, and after leaving school, Jason works fulltime for him doing “this and that” type of “courier” jobs. He meets Natalie one night when he drops into a local pub for a drink, having just finished another unsavoury job for Harry. He thinks she’s police when she offers him immunity for all the information he can gather on Harry’s activities. He agrees, hoping that this will mean he can escape his present sordid life and move his mother and brother Chris from their council flat to Crete. Why Crete?! He’d spent a week there as a little boy with his mother and it was the only time in his life that he ever saw her happy and sober. Jason uses the library’s computers to do all his internet banking and it’s here that he meets Lucy a beautiful, bubbly young girl who befriends him. He has never had a proper relationship with anyone before, either male or female. Lucy however, turns out to be the one shining light in this otherwise very dark and disturbing story. Kerry Wilkinson has written one of the most haunting, darkest stories I’ve read in a long time. But this book is worth reading for that very reason. It’s the perfect book for a book club, because there are so many facets to the story, e.g. Jason’s care of his alcoholic mother and being a father figure to his brother, who seems to be getting into his own mess with drug dealing. And then of course this relationship with Harry Irwell, who on one hand is the father Jason has always craved, but on the other hand is the merciless psychopathic boss of a huge illegal organisation. There are also many strings left dangling by Kerry Wilkinson. Could this mean that we get to meet Jason Green again? Have to admit to being a bit of a fan of this author's Jessica Daniel series of books so I was quite interested to see what Mr Wilkinson could do with a stand alone. Jason was "rescued" from a beating he was being subjected to by a gang of bullies who were after his trainers. I use the word rescued in quotes as the rescuer turns out to be crime boss Harry Irwell. Fatherless Jason is soon taken under Harry's wing and starts to do small jobs for him. Jason has his head pretty much screwed on right Have to admit to being a bit of a fan of this author's Jessica Daniel series of books so I was quite interested to see what Mr Wilkinson could do with a stand alone. Jason was "rescued" from a beating he was being subjected to by a gang of bullies who were after his trainers. I use the word rescued in quotes as the rescuer turns out to be crime boss Harry Irwell. Fatherless Jason is soon taken under Harry's wing and starts to do small jobs for him. Jason has his head pretty much screwed on right though as the majority of his money (that which doesn't go to support his alcoholic mother or younger brother) is squirrelled away into the bank for their future. Then one day, after recently meeting two quite different women, Jason wakes up to exactly what he is and who he has become and, although he hasn't quite reached his goal savings wise, he knows that time is running out for him to quit this dangerous life. The story is set in the present day with flashbacks to past events used to illustrate and provide information pertinent to what is happening in the story line. This to-ing and fro-ing is very easy to follow and flows naturally. The characters as always are mostly well defined and easily to emote with / relate to. I do like my stand alone books to wrap up neatly but, unless I missed some key points, I finished this book with quite a few unanswered questions. I wonder whether this is intentional to give the reader scope to come to their own conclusions or if it is the "in" to potentially write more with these characters. I am not the biggest fan of this in a book billed as a standalone, but realise that others might embrace this. I am not going to mark the book down for this as it is a ME thing and I feel that mentioning this here is sufficient. That said, I found the writing style to be easy to read (as always) and the storyline kept my attention throughout, dropping in plenty of twists and turns to keep me on my toes. It certainly kept me satisfied whilst waiting for the next Jessica Daniel book. I was lucky enough to receive an advance review copy of this book.... having read all of Kerry Wilkinsons books so far I was thrilled! I have given the book 3 stars as, for me, there just felt like something was missing from the story - the story didnt flow as well as Wilkinsons other books. The main character, Jason, is likeable enough and the premise of the plot was well thought out and kept the reader guessing. **This is where my review gets tricky as dont want to give any spoilers away! ** Howe I was lucky enough to receive an advance review copy of this book.... having read all of Kerry Wilkinsons books so far I was thrilled! **This is where my review gets tricky as dont want to give any spoilers away! ** However, the set up of the storyline and the development of suspense just didnt flow smoothly for me. In my mind there just wasnt enough reason for Jason to be as paranoid as he became... his feeling was totally justified by the climax of the book but the buildup was disjointed and not eventful enough. At one point the reader is not included within a key part of why Jason starts to be concerned and suspicious (a conversation with Natalie in the car) - subsequently Jasons descent into paranoia therefore feels false to the reader as it doesnt totally makes sense. So much so that I had to use my Kindle search facility several times just to check I hadnt accidentally missed out a chapter or two as that is what it feels like! I liked the majority of the characters and I feel they were well developed especially the dynamics between Jason, his mum brother. However, Jasons basic character doesnt quite tie with the character he is supposed to play within the criminal organisation. Jason seems to young and simple to be allowed to be involved in such high level meetings and activities. I was also confused by Jasons love interest, Lucy.... her behaviour and personality seemed so out of place within the story that I assumed that she would be part of the end 'reveal'. As you can see on my Goodreads profile, I have read all books by Kerry Wilkinson and have consistently rated them four or five stars for the most, my favourite series being the Jessica Daniel one. Therefore, it was with high expectations that I sat down with a cup of tea and a couple of biccies to read my review copy of Down Among the Dead Men, Wilkinson's latest stand-alone novel. First, I need to commend the author for his ability to play around with different styles of writing and settings. Wh As you can see on my Goodreads profile, I have read all books by Kerry Wilkinson and have consistently rated them four or five stars for the most, my favourite series being the Jessica Daniel one. First, I need to commend the author for his ability to play around with different styles of writing and settings. While the Jessica Daniel series is largely based around good old banter and sarcasm in its tone, this latest effort is a darker thriller that reminded me of Donnie Brasco in parts: I was dragged into that underworld atmosphere where everyone is threading carefully and constantly watching their own back. I also particularly liked the use of flashbacks, which broke the rhythm of the narrative in an interesting manner and provided more context as to the events that shaped Jason Green's personality and now motivate his current actions. This might be controversial, but I found that Jason was somehow a likeable chap: Yes, he could be viewed as a violent thug but, at the same time, he seems to have principles and morals which he is not willing to compromise. And, in fairness, he hasn't been dealt with the best cards in life either. Now, I was left wanting for more when I reached the end of the story. Even though I was quite surprised at the final twist which I admit I never saw coming, I was still slightly disappointed as to the many questions that are left open. One of those being a small thing in particular that keeps happening to Jason and gets a lot of focus throughout the narrative, but which is still left unexplained at the end. I guess I am one of those people that need everything spelled out for them at the end of a book. This was the first stand alone book I had read by Kerry Wilkinson. Previously I have read some of the Jessica Daniels series, so was aware of the possible quality of the writing. Down Among the Dead Men is a gritty look into Manchester's criminal underworld. The first chapter introduces us to a young Jason Green who is trying to escape being mugged for his brand new trainers, he takes a bit of a beating and is saved by Harry Irwell, who is a notorious crime boss for the south side of Manchester. The action then switches to the present day and we see Jason as an adult, clearly now working under Harry's influence. He also has to look after his mother and try to keep an eye on his brother too, who can be a bit unreliable. I can't help but feel that Jason isn't intentionally a criminal but has been sucked in and manipulated to become who he currently is, and after he meets two different women and spends a bit of time with both of them, he starts to question everything. I loved Jason's idea of an escape plan, and was very impressed with the big bucks being paid in the criminal world in Manchester. It didn't take long for me to be fascinated by the story, its a world so far removed from my own, but yet the writing really drew you in, and I was finding the further into the book I was, the more gutted I was when I had to put it down for real life to proceed. If you have read any of the Jessica Daniel series, I can say that this book is quite different, for starters it doesn't have a police presence, and this is far more from the criminal point of view, than law enforcement, however what they have in common is a talented author who is capable of drawing you into a world where crime is rife. I wasn’t quite sure what to expect when I began to read this book; I’ve read all of the Jessica Daniels series but none of Kerry’s stand alone works. This was quite different in style: much grittier, and making a conscious effort to scratch at the seedier criminal underbelly in the Manchester area. Jason Green is the central character in the book. We first meet him when he is a child and he is rescued from the neighbourhood bullies by a powerful, and seemingly decent, man: Harry Irwell. It transp I wasn’t quite sure what to expect when I began to read this book; I’ve read all of the Jessica Daniels series but none of Kerry’s stand alone works. This was quite different in style: much grittier, and making a conscious effort to scratch at the seedier criminal underbelly in the Manchester area. Jason Green is the central character in the book. We first meet him when he is a child and he is rescued from the neighbourhood bullies by a powerful, and seemingly decent, man: Harry Irwell. It transpires that Harry is a crime boss and far from rescuing Jason, he involves Jason in his criminal world. The plot was carefully executed and included many of the plot twists which I have come to expect from Kerry Wilkinson’s books. The characters had depth to them, and as a result of this, I actually felt as if I knew them. Throughout the book I couldn’t decide whether I actually liked Jason or not. This is, I feel, part of the strength of this book; I had a compelling desire to see what happened to Jason – especially as the book evolved and I learned more about his life – but I couldn’t warm to him as I had done with other of Kerry Wilkinson’s protagonists. Jason Green is 24 years old and works as a 'courier' for a well known Manchester gangster. Jason first met Harry 11 years previously when he is rescued from a beating at the hands of a group of lads who want to steal his new trainers! Harry takes the young Jason under his wing and teaches him the ropes. Jason's home life is rubbish - an alcoholic mother and a younger brother who is a liability. We see the story of Jason's life through a series of flashback chapters interspersed throughout the mai Jason Green is 24 years old and works as a 'courier' for a well known Manchester gangster. Jason first met Harry 11 years previously when he is rescued from a beating at the hands of a group of lads who want to steal his new trainers! Harry takes the young Jason under his wing and teaches him the ropes. Jason's home life is rubbish - an alcoholic mother and a younger brother who is a liability. We see the story of Jason's life through a series of flashback chapters interspersed throughout the main storyline, and slowly realise that Jason's relationship with Harry isn't as happy as we first thought. Whilst reading I came to really like Jason's character, after seeing what he had gone through as a child, to grow up to be the adult of the family, still caring for his mother and searching for his brother when he goes missing. I really wished him a glimmer of happiness when he met Lucy at the library. Maybe they get a second chance after the story's conclusion??? He is really is a naïve young lad all the way through, with his dream of moving one day to his 'happy place'. Fans of Kerry's Jessica Daniel books will recognise place names as this book is set in the same area of Manchester, and there's even reference to the Nicholas Long case solved by Jessica in Thicker Than Water. In fact, Kerry's books seem to be entwined with each other, with storylines and characters popping up in the JD series, Andrew Hunter and the standalones. Anyone who has read the short story January will recognise Jason's brother as the lead character's friend. Overall an enjoyable read and definitely recommended for fans of Jessica Daniel. After finishing this book I am still a little undecided but have gone with a middle of the road rating because I’m still unsure. I have never read any Kerry Wilkinson books but do have a couple of his books in the Jessica Daniels series to get started on. This one was a standalone so I thought it may be a good place to start. Okay, so why the middle of the road rating? Well essentially the writing was excellent in terms of story flow and getting into the book quickly. What didn’t work for me were After finishing this book I am still a little undecided but have gone with a middle of the road rating because I’m still unsure. I have never read any Kerry Wilkinson books but do have a couple of his books in the Jessica Daniels series to get started on. This one was a standalone so I thought it may be a good place to start. Okay, so why the middle of the road rating? Well essentially the writing was excellent in terms of story flow and getting into the book quickly. What didn’t work for me were the characters. I tried and persevered but even towards the end I still wasn’t entirely convinced of the main character Jason as well as his ‘boss’ Harry. Jason was saved from a pounding when he was a young lad living on a rough estate. What he didn’t realise was that the man who saved him was Harry Irwell, a man who he would end up working for. Jason was a pretty average character to read about, and even towards the end I didn’t like or dislike him, I was just indifferent. In addition to that there were a couple of occasions which involve Harry which also didn’t feel right. Harry came across as a very bland and stereotypical ‘Crime Boss’. The story itself was okay and there were times when I became engrossed, it just didn’t have enough of a pull for me to rate it any higher. I thoroughly enjoyed reading a review copy of this book. It starts eleven years ago and leads into a riveting tale. The mugging in a Manchester alley was not an unusual occurrence but the intervention that followed was, and led to Jason’s life being changed irrevocably. This was not just a matter of getting in with the wrong crowd. His rescuer, Harry Irwell, has a name synonymous organised crime. I followed the story with a distinct feeling of unease and whilst sympathetic to Jason’s circumstance I thoroughly enjoyed reading a review copy of this book. It starts eleven years ago and leads into a riveting tale. I followed the story with a distinct feeling of unease and whilst sympathetic to Jason’s circumstances I found the depth of his involvement disturbing. The narrative runs between Jason’s past and the present day. Occasionally I found this a little frustrating, wanting to continue in the current time but elements of Jason’s history did lead to a better understanding of both him and his associates. Overall the book is well paced and absorbing. There were time when the forcefulness of the action made me shudder but I was unable to put the book down. Yet again Kerry Wilkinson provides an unexpected ending, however questions remained unanswered and although there are implications, I was left to draw my own conclusions. I have not stopped going over them in my head. This is a book that will leave me wondering for a long time. An excellent stand-alone read from a prized author. Thanks to the author I read a review copy of this book. I am an avid Kerry Wilkinson fan and have read all his Jessica Daniel books. This, however is different, yet still excellent. Set in Manchester, this book tells the story of Jason, a gangsters 'right hand man' and his dilemmas through the years of his life working for 'the bad guys'. His story is told via flashbacks, as we learn about how he has come to be the man he is today and his fight with where he is now and what he wants from his life. Thanks to the author I read a review copy of this book. Set in Manchester, this book tells the story of Jason, a gangsters 'right hand man' and his dilemmas through the years of his life working for 'the bad guys'. His story is told via flashbacks, as we learn about how he has come to be the man he is today and his fight with where he is now and what he wants from his life. I love Kerry's writing style, and I was impressed by the difference. This book is a lot darker than his usual style - set in a criminal underworld. I was hooked when I started reading this and couldn't put it down. Kerry has the ability to describe the characters in such detail that you feel like you know them. Despite the lead character Jason being a bit of a bad boy you couldn't help but like him. At times throughout the book I felt myself worrying for him, and hoping everything was going to turn out ok! This book had a great ending (as always with Kerry Wilkinson) and my husband gave me funny looks when I exclaimed 'I knew it' out loud!! It would recommend this book even if you have not read any of Kerry's books before, it's a real page turner. Jason Green would not stand out in a crowd. He is deliberately inconspicuous. He inhabits a shady criminal underworld and he does not want or need to be noticed. But someone has noticed him. This is the second book by Kerry Wilkinson that I have read and unlike the Jessica Daniel series this is not a whodunit, but more of a psychological thriller. Perhaps I am doing it a disservice trying to categorise it at all because it does not fit neatly into any genre. This is a stand-alone story that will Jason Green would not stand out in a crowd. He is deliberately inconspicuous. He inhabits a shady criminal underworld and he does not want or need to be noticed. But someone has noticed him. This is the second book by Kerry Wilkinson that I have read and unlike the Jessica Daniel series this is not a whodunit, but more of a psychological thriller. Perhaps I am doing it a disservice trying to categorise it at all because it does not fit neatly into any genre. This is a stand-alone story that will have you gripped, but be warned; you may burn your dinner, miss your bus stop or let your coffee get cold. Frankly my family got no food at all until I had finished the book. Wilkinson’s style is easy and effortless. In a few words he conjures up a vivid image such as the, “weary looking woman with a face liked a chipped paving slab.” He uses the flashback technique in order to make sense of the present by contextualising it with the past. We learn what motivates Jason, and it gives us empathy for him even if we never quite come to love him. It is a story about getting by, about dreams and about loyalty. Thank you to the author for a review copy. I am a fan of Kerry Wilkinson's books so was delighted when I was given an opportunity by the publishers to read this book in exchange for an honest review. The book is a stand alone and was quite a page turner. The pace is very good and I loved the main character - strong but also very naïve in some respects. The plot was good and I can see this kind of thing actually happening - very good and I thoroughly enjoyed reading the book. I am a fan of Kerry Wilkinson's books and was delighted to get a review copy because it meant I didn't need to wait till publication date to read his new book. I was not disappointed. I started reading it at the airport and got pulled into it so much I did not mind a 3 hour flight delay! This book is a different style to his previous books but what has not changed is his ability to draw me in, keep me interested with each event then surprise me right at the end leaving me wanting more. Kerry Wilkinson has had No.1 bestsellers in the UK, Canada, South Africa and Singapore, as well as top-five books in Australia. He has also written two top-20 thrillers in the United States. His book, Ten Birthdays, won the RNA award for Young Adult Novel of the Year in 2018.